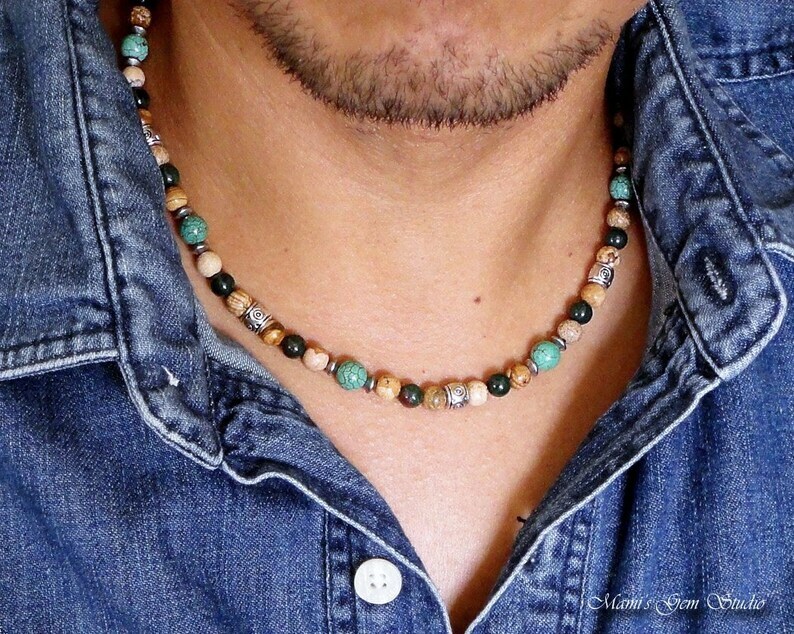 Handcrafted in my studio, this casual men's necklace features natural semi-precious gemstones - Tibetan green Turquoise in blue-green hue with brown veins, Bloodstone in deep forest green with occasional red spots, and Picture Jasper with earthy brown, tan, and cream tones. I have added metal beads/spacers in antiqued silver tone pewter and stainless steel to embellish the necklace, and completed with a stainless steel lobster clasp. Lead-safe. Great for everyday! This necklace exceeds my expectations from the pictures online. Great quality and looks great. Gotten several compliments already. Fast shipping too. Thanks!